Who knows where Black Plum Supper Club will strike next? 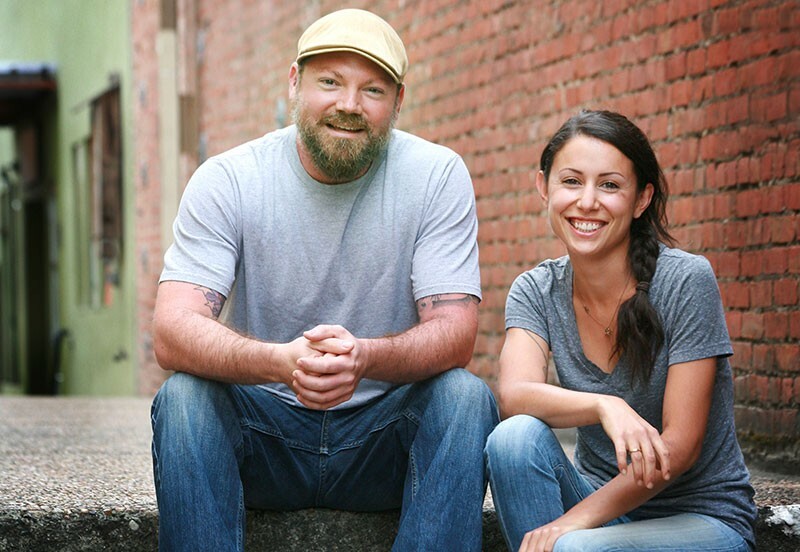 POISED TO POP Jeremy Whitcomb and Emma Uribe are the latest duo on the North Bay's rising pop-up restaurant scene. The first thing they do is unscrew half the light bulbs. It's 4pm, two hours before the diners arrive. A server snaps a photo of the dining room so that everything can be put back together again at the end of the night. They rearrange the tables and dress them with white linens and tea candles. The windows are opened to freshen up the air, the juicers are replaced with a bread station, and the white wines are chilled. By 6pm, they have transformed Howard's Station Cafe, the usually bright, bustling egg- and waffle-slinging Occidental eatery, into an elegant dining room. The Black Plum Supper Club opens its doors for another Thursday night. Started by chefs Emma Uribe and Jeremy Whitcomb on Oct. 3, Black Plum is the latest temporary restaurant to pop up on the Sonoma County culinary scene. It's also evidence of what two ambitious chefs can accomplish with fresh ingredients, a creative vision and a few low-watt bulbs. In some ways, Uribe and Whitcomb are an unlikely pair. A two-time restaurant owner who's lived in Michigan, New England and Portland, Ore., Whitcomb has logged several years in the kitchen. He left his native Massachusetts for Sonoma County two years ago, lured by the hyper-seasonal and locally sourced ethos of Northern California's food scene. A decade younger, Uribe, who was born and raised in Sebastopol, earned a degree in journalism from San Francisco State and then realized that she just wanted to cook. She quickly worked her way up from server to sous chef at Peter Lowell's by way of an unpaid internship. Whitcomb joined the kitchen in June 2011, and eventually they were promoted to co-executive chefs, sharing a natural command of the kitchen. "Jeremy and I hit it off very quickly," Uribe tells me. "We have the kind of working relationship that is the culinary equivalent of finishing each other's sentences. One person will have an idea and the other will play off of that idea until we have a complete dish." So when they found themselves without jobs this past summer (both had decided, within a six-month span, to move on from Lowell's), it was only natural that they started tossing around the idea of opening a restaurant. One problem: money. The solution: don't hunker down. Pop up instead. Uribe approached Chris Martin of Howard's, whom she's known since toddlerhood. "He said go for it," Uribe says, smiling. "It was surprisingly easy." They recruited good friend and fellow Peter Lowell's alum Jacque Westermeyer to be their front-of-house manager. The name "Black Plum" hit Whitcomb, suddenly, as if out of a tree. A supper club was born. For almost two months, Black Plum has been popping up at Howard's on Thursday nights, serving a four-course prix fixe meal ($35) to about 50 guests. Westermeyer handles all reservations and front-end details so that the chefs can simply cook. "You're allowed the mental space to focus on the food and be really creative when you don't have to worry about fixing the sink or the dishwasher," says Uribe of the advantages of their transience. Whitcomb chimes in: "We can be proactive rather than reactive. We can plan ahead and keep everyone happy." On their final evening at Howard's (the time has come to move on), Uribe and Whitcomb gave a traditional Hanukkah meal a swanky makeover. For the amuse-bouche, they elevated the classic charoset (a fruit and nut appetizer often eaten at Passover) with a dollop of red wine and cinnamon sorbet atop a tiny bed of walnuts, apples and (the happiest surprise) caramelized onions. Latkes, like people, are only as good as the company they keep. At the Black Plum, they came dressed with horseradish crème fraîche and paired perfectly with a delicate house-cured coho salmon, creamy apple and fennel purée, and a radish and caper relish. While pleasingly savory, the matzo ball soup was a little too schmaltzy for this (admittedly uninitiated) gentile. (My husband, however, finished every last drop). But when the main course arrived, I was glad I'd skipped a few matzo balls: I would have plenty of room for the pastrami-style brisket set in front of me. Brined for three days, smoked for six hours and steamed for another hour, the meat was tender, infused with the heat of black peppercorns, and served with rye bread, pickled cabbage and pearl onion mostarda. Deli counter meets gourmet. For dessert, we ate blintzes straight from heaven: pillowy crêpes stuffed with the freshest ricotta, soaking in damson (aka black) plum preserves with a dusting of powdered sugar. People continued to arrive and warm the room, lingering over bottles of wine as Carla Bruni's jazzy French vocals kept the mood light and carefree. Even the hand-written check on creamy card-stock was charming. Going underground for the week of Thanksgiving, Black Plum will pop up next at Forchetta Bastoni on Saturday, Dec. 7—and after that, who knows? "You pop up and you pop back down again," says Whitcomb. "We are open to possibilities," echoes Uribe, "that's what makes this fun." To get on the Black Plum mailing list, email info@blackplumsupperclub.com.